Please Scroll all the way down to go to the Final Reveal of this Stone Cobra SCAM straight away. Based on the reactions in those posts it´s clear there were directly some doubts but we´re not able to address them at that point. This already showed how hard it was to expose this scam since it were not just some random collectors who´re asked for their input there. As you can see also Beastformers replied and even though there´s no 100% certainty there either because, determining original figures based on pictures can be tough and in this case, there´re just a few strange things. 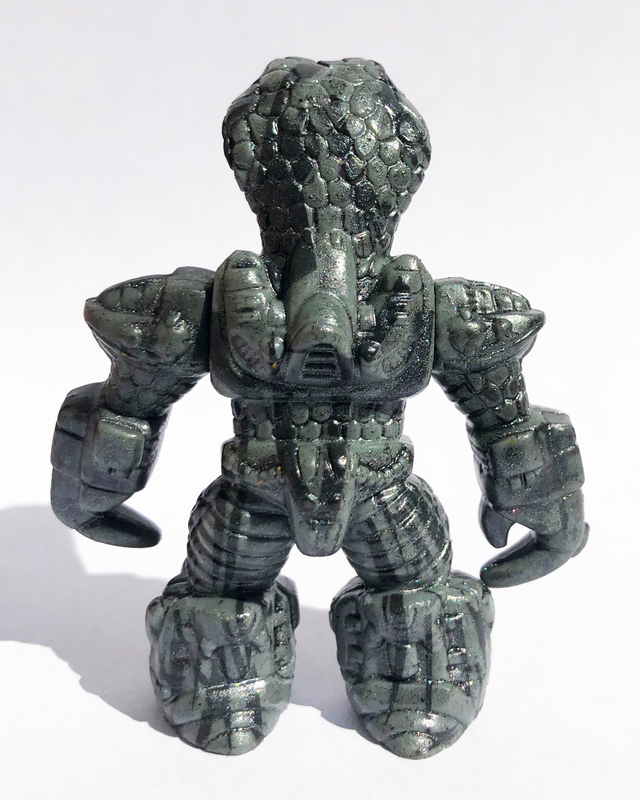 With a completely (unpainted) Grey one showing up (with wrong arms) there´s always the chance/hope of finding a rare prototype of some sort so you have to keep certain options open even though it´s not very likely. So we ALMOST got fooled as well. In the period after those posts more and more Stone Cobra´s kept being listed, all coming from the so called ¨B-mold¨, and with that our concern kept growing because in just a few months time a number of Stone Cobra´s had shown up which you´d normally not even see in a period of 2 years or more. Sadly enough we have not been able to address this concern any sooner than today, and thus some fellow collectors did get burned, simply because we needed to be 100% sure about it. With all the doubts on the table from the beginning, the increase of Stone Cobra´s available and with the recent help of those collectors who did get burned (some of which were aware of the doubts willing to take the risk) and were able to share the insights and pictures needed to reveal this scam having the figure in hand. Now the doubt is over and thanks to the Battle Beasts (BB) Community this Stone Cobra Scam is revealed! ALL pictures in this publication concern Fake versions of the Stone Cobra unless it´s mentioned on the picture itself as ORIGINAL (this is done via Edit by the Beastformers Team so don´t be fooled to get tricked by possible future listings with Original added to the picture, on this page there should be more than enough details for you to keep in mind to tell for yourself whether you´re dealing with an Original or a Fake). 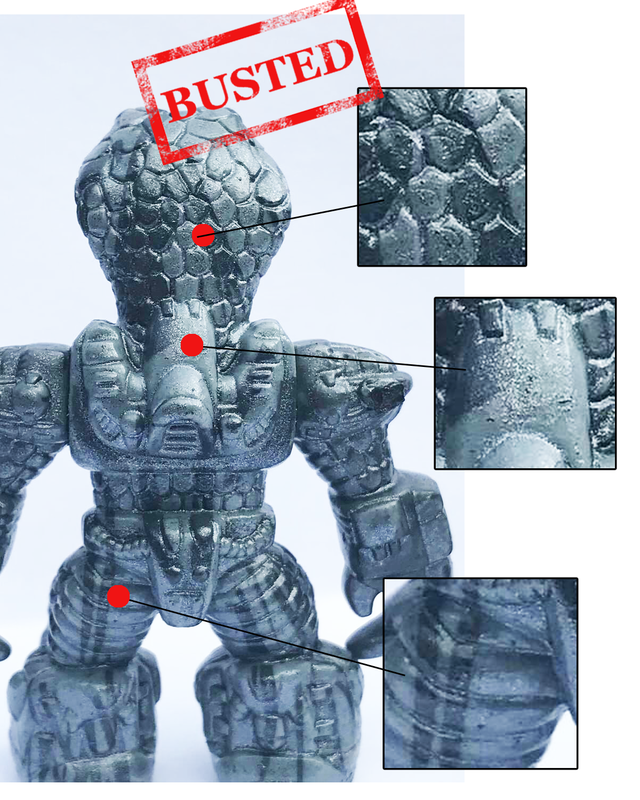 The reason why this issue is shared and addressed on The Beastformers Blog, which is normally a place solely for and about Original items, is obviously to warn the rest of the BB Community and fellow collectors in order to prevent them from getting burned and at the same time to protect the original line against the negative influence of fakes. ALL sellers and shops involved, of which most of them seem to have been burned themselves, have been notified before the publication of this post so they have had the time to adjust the description or end their listings. It´s also likely that some will adjust or change them after this post once they´ve hereby had access to the same insights as the rest of the BB Community making it much easier to recognize the Fake Stone Cobras. Hopefully this exposure and intervention is enough and it will directly or indirectly lead to the end of the creation and distribution of these Fake Stone Cobras! It´s up to the sellers and shops to act now but feel free to address this issue to them on behalf of the BB Community when you still spot one in order to make them aware of it as well. Because it´s likely to assume that a self-respecting seller or shop doesn´t want to have anything to do with this, at least let´s hope so. To some of you these Stone Cobras in the slideshow above might be just regular looking Stone Cobras while other might spot some oddities like we did in the beginning. But all in all with those pictures and without any further insight in material, looks and feel from the first person perspective having one in hand it remains debatable whether or not they might be false or not. Of course once you know what to look for things will start falling into place but also for us it took a little because the quality of these reproductions is pretty high. Once a listing or auction starts with lines like that in the header this is one of the first things to have your alarm bells ringing because this is often a sign. 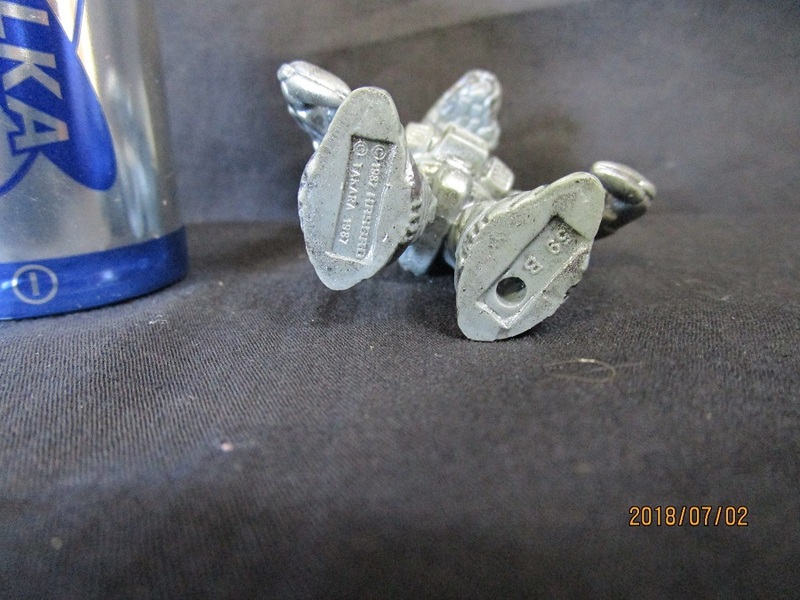 Either of a seller who thinks the figure is worth it´s weight in gold, while in most cases it isn´t, or there are other details that have to be covered up. 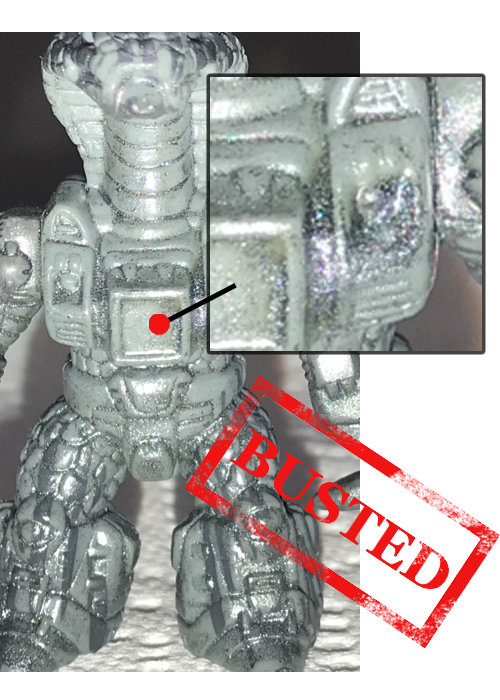 But this is a general thing so this also goes for other figures within the Battle Beasts and Laser Beasts line so make sure you´re informed well to prevent you from overpaying or getting burned, especially once it´s a FAKE figure! 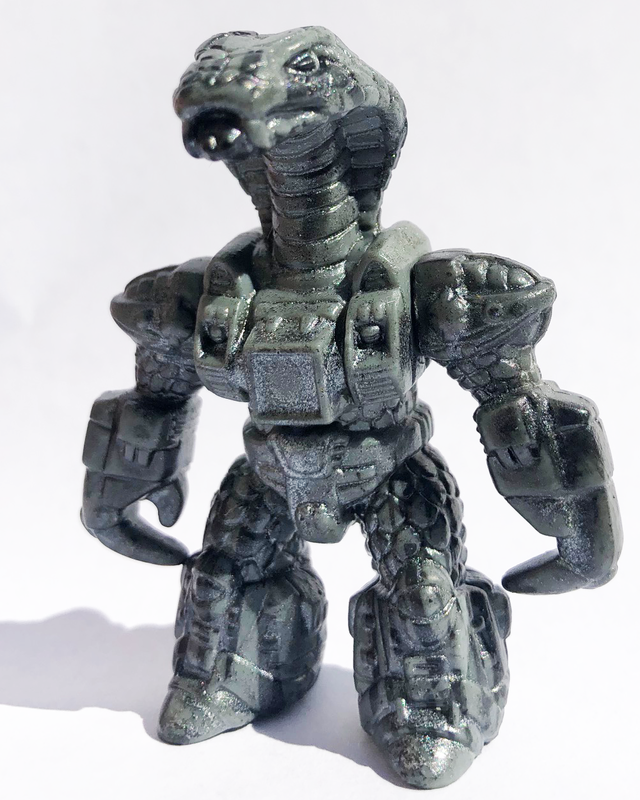 This ¨Unpainted¨ Grey Stone Cobra was one of the first we were confronted with and without having any marbling (stone) effect on it it could potentially have been an early stage sample of some sort. Some of you might think the two claw hands would be an obvious no go but amongst ¨Test Shots¨ that´s a common issue since it wasn´t about the looks but more about the functioning of the gimmicks like do the arms rotate well, etc. The reason why we didn´t go after this one was because of the picture shared of the supposed to be normal Stone Cobra which as shown alongside in another picture. 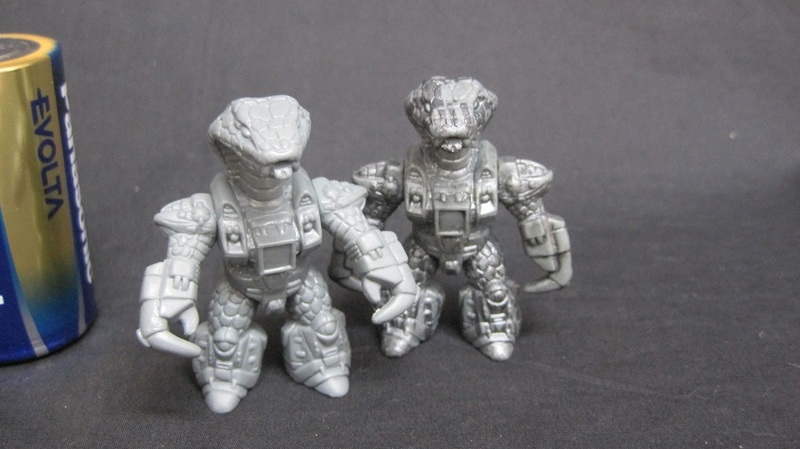 For some reason that one looked a bit strange to us and it made the ¨Unpainted¨ one look a bit off in color. Again this is hard to tell because the presence of (artificial) lighting has a crucial influence of how colors turn out on pictures but in this case the gamble was to big. With the stamp being such an important checkpoint another thing was noticed on a Stone Cobra listing shortly after and that is that it had a ¨B-mold¨ stamp underneath its foot while you´d normally expect a test sample to be working with the first mold around which would´ve been the ¨A-mold¨. But with the Stone Cobra using the original mold of the normal Series 3 King Cobra it could have been possible that they used the ¨B-mold¨ for testing for the same reason the matching arms were not a priority in the testing phase. 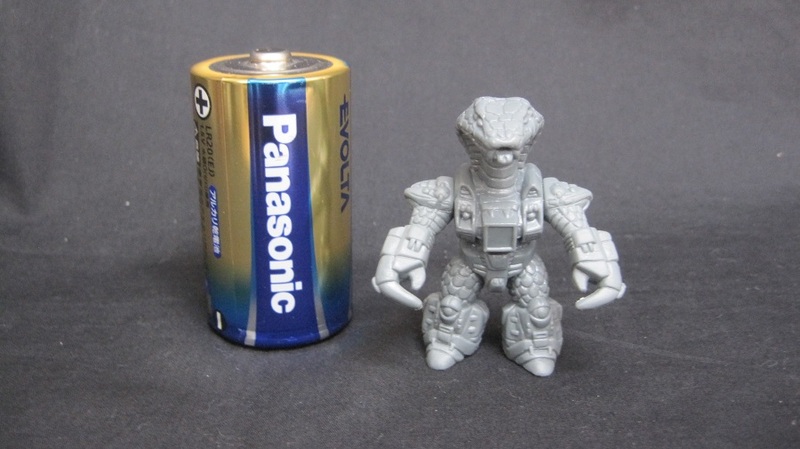 But knowing the Stone Cobra is around in ALL three mold versions (A,B and C) it´s still a bit strange. 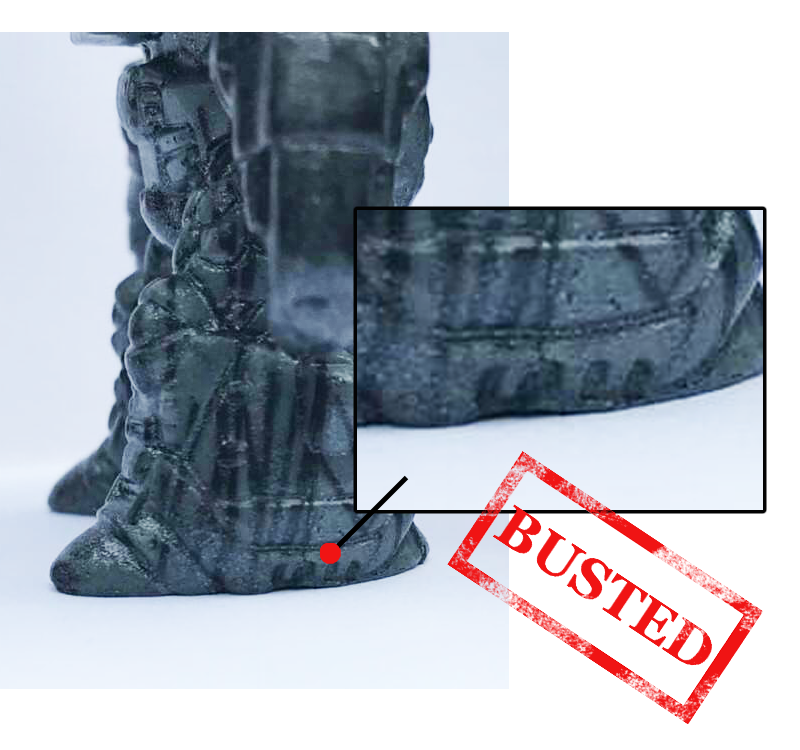 With the focus on that mold number also the bottom of the feet got extra attention and this has been, from the beginning, the most concerning detail because it looks a bit messy compared to the Stone Cobras we knew about. The lining and the color of the ¨painted¨ Stone Cobra that got listed shortly after the Grey one and which looked similar to the pictures of a more recent one as shown on the pictures also looked a bit off especially on the back. With lines that seemed to have been applied by hand and (a lot of them) being relatively straight at least in a completely different pattern than what you´d normally see on a Stone Cobra which is much more random making that each one is unique as its striping can be considered its finger print. The reason why we were not able to reveal this scam any sooner than now is the fact that based on those doubts and without proper first sight information from fellow collectors having one in hand and having to many gaps wouldn´t be enough to accuse anyone. Because the ¨poor¨ quality of the bottom of the feet could´ve just as easily been a normal figure that´s come out of a bad run or something. Before going all in revealing a scam like this we had to be sure there were at least 2 Fake Stone Cobras to work with that could be checked and verified, alongside all the pictures we´d gathered over time, in every way needed. Like pulling arms to check the inside, having shots under daylight conditions, detailed shots, etc. With those two around and the pictures coming from them, both having a messy bottom of the feet, and other odd details that came to light it soon became clear that this was indeed a scam BUT we still couldn´t tell how this figure had been casted. Which again shows that the production of this Fake Stone Cobra, when it comes to casting, has been done in a very professional way with the full awareness of not making any mistakes there. All in all with the doubts, not having the Fakes in hand yet and with the unsolved casting process issue this resulted in the fact it took so long. Sorry for that but luckily, along the way, we´ve always had and spoken out our doubts in regards to these figures meaning that those of you who didn´t want to take a risk should´ve always stayed on the safe side. Having all the necessary data in hand it was ¨just¨ a matter of thoroughly going over everything again focusing on what possibly could explain the way how these Fake Stone Cobras have been casted. And to our surprise it´s been done even more subtle than expected. A smart move from the scammer but as always the answer is in the details and with our knowledge of this line there´s no way not to get caught so the Beastformers Team can now officially say: BUSTED! In the next part of this publication the Beastformers Team will reveal the crucial (distinct) details that will help you to determine whether the Stone Cobra (¨B-mold¨) you´ve purchased during the last few months is an Original or a Fake or to help prevent getting burned having the knowledge of determining this ahead of your purchase in the future. For obvious reasons the Beastformers Team will only share a certain amount of the details found during our research, enough for fellow BB Collectors and others who are interested to tell the difference but at the same time holding back some crucial details. This is done in order to prevent giving people with the wrong intentions to much information that could potentially become harmful to the BB Community and the BB line again. Enough talking about doubts and intentions, by now it should be clear why this publication is out, so let´s take a look at some of the crucial details. The detail that´s been the most concerning and doubtful since the beginning turned out to eventually also be the one that gave away the procedure of how this figure was produced. Once you look at ALL (some more than others) these Fake Stone Cobras the returning detail is the messy finish of the bottom of the feet, especially the left (outer) side of the left foot in this particular photo (above). It looks as if a part or chip has broken of there. You can also note some tiny holes that look as if that´d have been caused by air bubbles a common issue that´s though to completely avoid during casting. Exactly there were the issue is found on the bottom of the feet an interesting (crucial) detail is found on the side of the foot (both sides). There where the Original figure has a smooth looking design the Fake Stone Cobra seems to have a number of tiny cavities which almost look as if they´d have been part of the design. BUT that´s not the case and it are those holes that have been used to cast this figure in a very subtle way. This detail was recently discovered by on of the collectors involved in this research and it instantly caused that all pieces of the puzzle felt together. In the end this is THE detail that was needed to reveal this SCAM. And obviously this detail was also found on the possible RARE ¨Unpainted¨ version from the beginning. 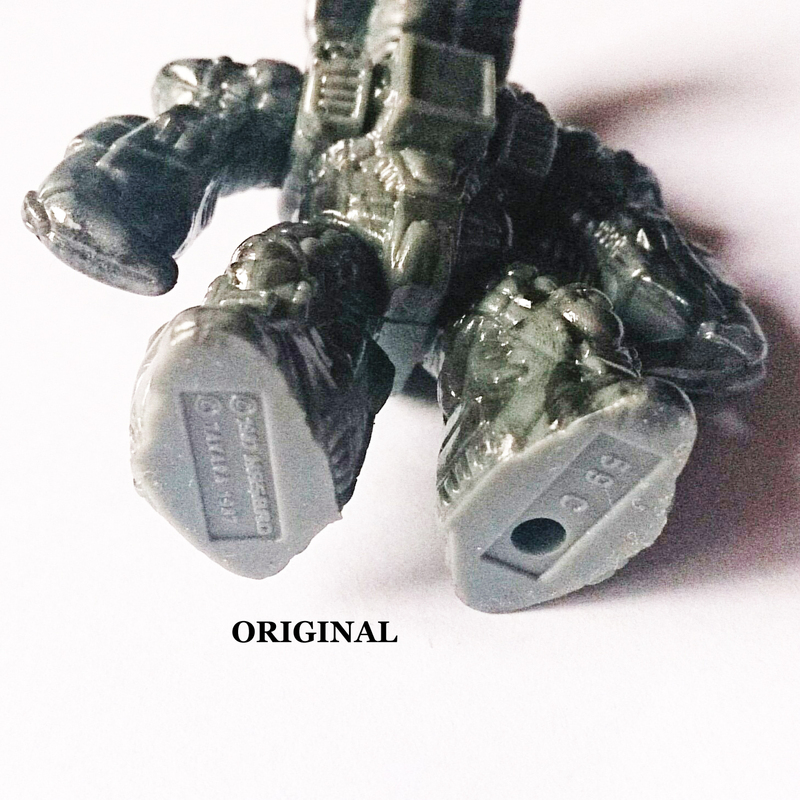 When it comes to Battle Beasts the Mold Marks are always a good guideline to check as well when in doubt and having better more detailed pictures in hand it soon became clear that on NONE of the Fake Stone Cobras the original Mold markings were present. This complete absence is ¨unique¨ and thus another mistake made by the scammer. The Mold marks are those tiny little circles that can be found on the backside of the Beasts showing the imprint of the original mold. It is found on ALL original Cobras around; Series 3 King Cobra (A,B,C) and Stone Cobra (A,B,C). 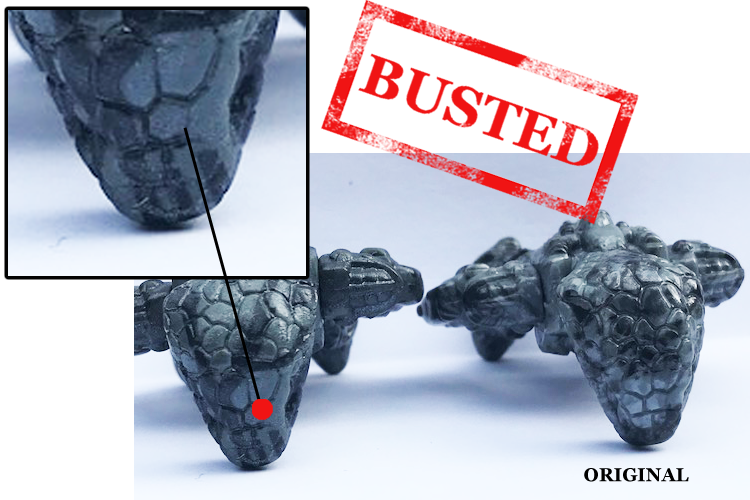 Once you know where to look for these (Red dots area on the Fake Stone Cobra) you´ll easily spot them on the originals. And last but not least, after having shared the most crucial details that revealed this Stone Cobra SCAM, is something remarkable. A Rainbow Glitter effect that was found on ALL of the painted versions of the Fake Stone Cobra. Really…?! This is another detail that´s only discovered after having the figure in hand and once you noticed this there´s obviously no way to get around it either. BUT having only the original pictures it´s exactly this ¨gimmick¨ that creates the Glossy finish that the Original Stone Cobra has. So even though it looks odd now it´s again of smart way to mimic the appearance of the Original figure. Seeing this it is quite sad to see this has been around and unrevealed for so long but it also shows how thought through this whole scam has been using all tricks and applications possible to trick us. This isn´t something that needs a whole lot more attention in our opinion because once you only look at the picture above showing the Glitter effect you´ll directly see the start and the end of some lines as well as lines of equal thickness. Also lines seem to end in a very abrupt way in some cases whereas based on the application process of the original figure this would be impossible and way more random. By now it should be clear that this whole process of Revealing this FAKE Stone Cobra SCAM didn´t happen overnight and it was really a matter of perseverance and making sacrifices for those who did take the risk to buy one (although with the idea it´d be a help to gain more insight). But in the end it´s worth it because it turned into this solid publication which should be a Warning to the BB Community to keep their guard up at all times! 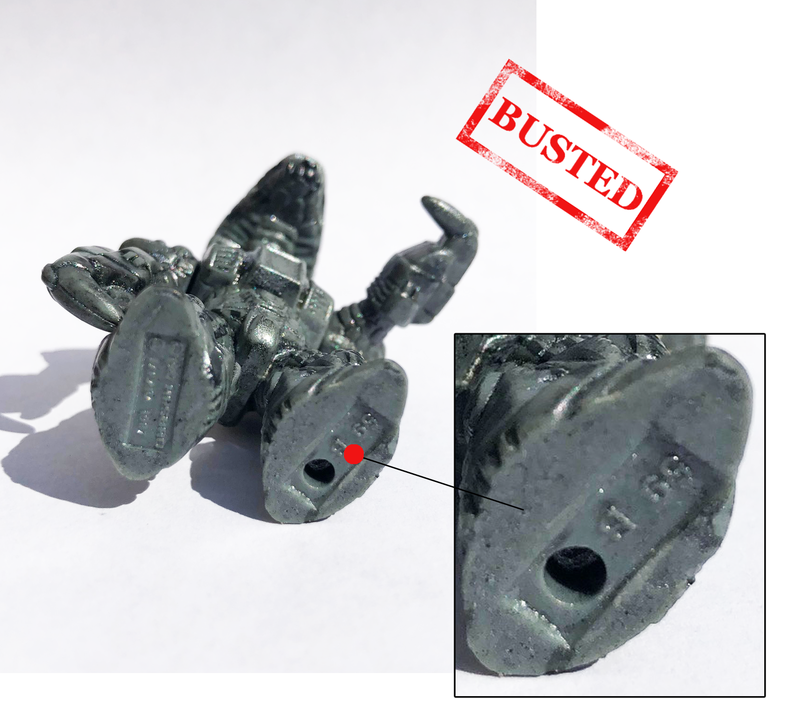 With all that´s known now it is clear that the ¨Unpainted¨ Stone Cobra that started it all was the ¨Unpainted¨ base version for the creation of the Fake Stone Cobras. Some striping was added as well as some Rainbow Glitters and an almost perfect SCAM was created, ALMOST. Please feel free to reach out if you have or find another figure that you might have doubts about and keep in mind that even though in this case it´s been specifically about the Stone Cobra ¨B-Mold¨ don´t be fooled in the future once doubtful A or C molds might show up. Premium items within the BB line will ALWAYS remain vulnerable to scammers because those are the items they (easily) can make money of but as long as the Beastformers Team is around with the support of the rest of the BB Community NO scammer will be safe. A special word of thanks goes out to everyone involved from the beginning with Lord emailing me discussing about these doubtful listings to those who´ve been part of the discussion in the first posts on LRG and the ones who´ve been helping out providing with the necessary pictures and details. 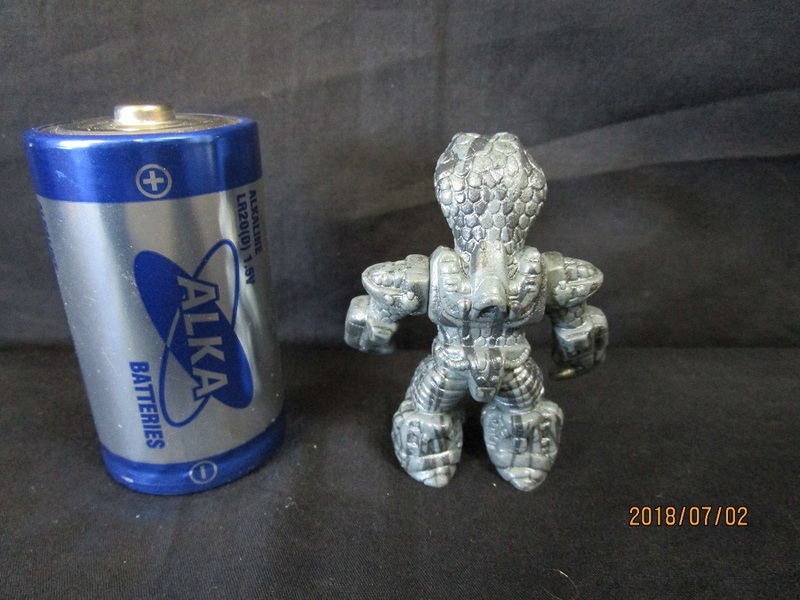 Exactobeast has been the one sacrificing himself purchasing a Fake Stone Cobra taking a hit for the team resulting in the fact that the required two Fake figures were available to consult and verify our findings back and forth. And to all others directly or indirectly involved, you know who you are, that didn´t want to be named. Without all of you this wouldn´t have been possible and a lot of (new) collectors could´ve been burned because of this so thanks again and it´s great to have such a strong Community supporting the line!